For an existing environment I had to change the VLAN and IP address that was used on the VMware vCloud 5.1 Cell. In VMware KB 1028657 is written how to change the IP address in the database and in the vCloud Cell config, but there is no mention of how to do this at Linux level. This post will show you the whole process. Before we start there is a little thing to be aware off. vCenter SSO is NOT suited to authenticate ‘normal’ vCloud Users. When I installed vCloud I saw a nice little checkbox that said “vCloud integration with vCenter SSO” and I checked it, because that is of course what I want. Wrong, you don’t want this, because now every user will be authenticated against SSO and, this is the real problem, there then needs to be a direct connection from the client device to the SSO server and this is probably not desirable. You’ll see the browser trying to logon to vCloud and reporting it can’t find server xyz, which is your SSO server and you just locked yourself out of your vCloud. Logon to your vCloud Cell as admin, go to “Administration” and select “Federation” and at “Identity Provider”, do NOT select “Use vSphere Single Sign-On”. I’m using RedHat linux as platform for the vCloud Cell with VMware Tools installed. In my configuration the first nic remained unchanged (eth0). The second nic (eth1) would be switched to the new VLAN and a third nic would be added to the new VLAN. Make a snapshot of the vCloud Cell you’re working on. Change the VLAN of the 2nd Nic to the required VLAN. Note the Mac-address of the nic. Note: to Save changes in the vi editor press: :wq (don’t forget the : ). To cancel without saving changes use: :q! Can you still resolve the FQDN names of your important servers like vCenter Server, SSO Server and your database server. 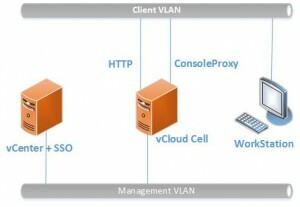 Can the client devices ping the vCloud Cell? In this zz is the IP address of the network you’re trying to reach over eth0 and yy is the IP address of the gateway on eth0. Again check if all servers you need to reach are reachable. When your new IP configuration is working correctly, continue to edit the vCloud settings. The following steps are taken from KB 1028657 but in some points I made small adjustments. Well, here we are. You’re done. Let’s start the vCloud Cell and see if it will still run. Now logon to the webportal from your new VLAN. All working? Don’t forget to remove the snapshot. vCenter, vCloud, vCloud Director change IP, cloud, ip address, sso, vcloud, vCloud Director. permalink.